Lightweight. Sturdy. Functional. Easy To Install. Safe. 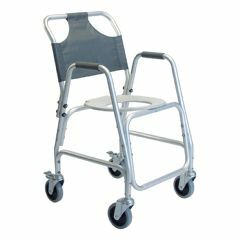 This chair is very sturdy, the wheels are large and roll over threshholds and carpets easily, and the mesh back is supportive. I recommend it highly. I thought that this product would make taking care of my disabled husband a little easier, but unfortunately that wasn't the case here. Although the aluminum frame made the chair very light, I received it in a damaged condition. The bolts securing the back of the chair to the base were broken off, but at first I felt that chair would still work if this was fixed. However, the chair really was not safe because the brakes were only on the rear wheels and the not the front wheels, so the chair would not stay in place at the toilet or in the shower. do arms swing or fold down for transferring? Asked on Aug 16, 2013 7:06:58 PM by selmy from haverhill, MA.